Former Verizon lawyer Ajit Pai today stands victorious. His tireless efforts to deny the will of an overwhelming majority of American citizens have come to fruition: net neutrality protections are today officially eliminated. Our democracy was born from the forges of war and watered with the blood of patriots. For more than 200 years our politicians have stood as the vanguard and creators of the policies that govern our freedom, while brave men and women have taken up arms in defense of our nation. But today, our democratic principles were packaged and delivered, in a gilded basket, to greedy corporations by the men and women of the GOP. Millions of dollars have passed hands between Republican members of congress and lobbyists for Verizon, AT&T, Comcast, and other members of the telecommunications industry. And the laundry list of outright, blatant, provable lies told by those corrupt politicians while accepting telcom’s payola is too long to include in this article. Yet, here we stand. 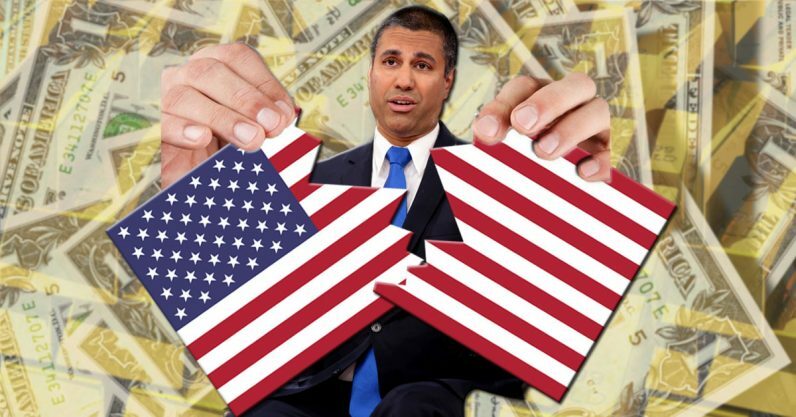 Over 80 percent of all Americans wanted net neutrality protections to remain, but despicable greed, treacherous arrogance, and a complete and utter dismissal of the political mandate to serve the will of the people have ensured that Pai’s pockets are lined and his promises to corporate shareholders kept. Sure, it’s worth mentioning that Ajit Pai is being investigated for corruption, AT&T is under scrutiny for tampering, and there’s almost nobody in the Trump administration who isn’t under investigation by the FBI and special prosecutor Robert Mueller. None of that matters. It doesn’t matter that a democratic society has a mandate to follow the will of the people. It doesn’t make the slightest bit of difference that the FCC lied about being hacked so it wouldn’t have to admit that the overwhelming response to its “call for comments” was from millions upon millions of people begging for net neutrality to remain. The only thing that matters, in the US, is that our politicians are for sale. Any policy, whether it’s a protection against dumping deadly chemicals into water or legislation that stops internet companies from being the ultimate arbiters of fairness, can be bought or sold in the US. Democrats are nearly as complicit in this as Republicans. Instead of joining their GOP counterparts in suckling at the greasy teats of telcom, they’ve sold out the American people for votes. Rather than fight with everything they have, they’ve watched as net neutrality was destroyed: it’s gonna be a great talking point in the November midterms. So when Ajit Pai stages a skit, laughing at us all, where he pretends to be a shill for Verizon, it’s not funny. He’s spitting on every American who feels as though they were betrayed. He mocks the vast majority of us so that, like Donald Trump, he can rile up his relatively small base. Today, in America, we awoke to a nation where corporations such as Comcast, Verizon, and AT&T have swayed the US government to remove protections for citizens so they can increase profits for themselves and the companies that stand to benefit from paid prioritization. Another political event will happen today: soldiers, sailors, airmen, and marines from the US will engage the enemy for the 6,117th straight day of war – by far the longest in our nation’s history – some will die. Our brave warriors, on this day, fight for democracy overseas while their government sells it for silver at home. RIP net neutrality. RIP American democracy.